Barbie spectacular enrolled in ballet classes, has always dreamed of being a dancer. Is preparing to go to your first class, you have everything almost ready, only needs to choose the clothes, helps make up and painted on her face a cute floral design that matches the dress dancer, you also need to select a cute crown and earrings that make it shine. Do not forget that the first class will be your cover letter, so that: Strive and make beautiful princess look like a professional dancer. 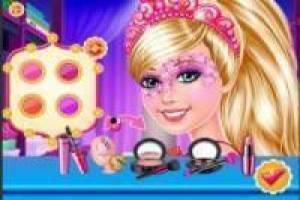 Enjoy the game First-class ballet Princess Barbie, it's free, it's one of our barbie games we've selected.